Oil Solutions Powder is a unique super-absorbent to clean up fuel, oil and other hydrocarbon spills on both hard surfaces and on water. OS Powder is a non-toxic, fast and effective means to respond to a spill. Easy to use and clean up. Absorption is instant on contact and OS Powder absorbs 13x it’s weight..
OS Step 1/Step 2 is a unique absorbent that remediates and cleans up hydrocarbon spills from hard surfaces and soils. Through a patented microencapsulation process, the hazardous characteristics of the waste such as ignitability, corrosivity, reactivity and toxicity, are quickly eliminated. Upon contact the odor of the waste and the stain left behind are also eliminated. Here at Oil Solutions we try to help our customers avoid environmental messes and if we can help you stop the problem right at the source we’ve done our job. 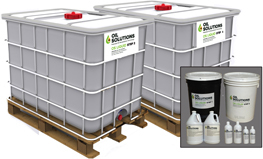 Remember that if there happens to be a spill you can depend on Oil Solutions’ liquid and powder cleanup supplies to clean up your hydrocarbon spills completely without leaving an environmental impact. Trust Oil Solutions to aid you with any oil spill mishaps and to prevent them entirely with our oil containment products.